Sunlight bathes the entire northern hemisphere of Saturn, highlighting the hexagon-shaped jet-stream. NASA's Cassini spacecraft took this image with the wide-angle camera September 9, 2016. 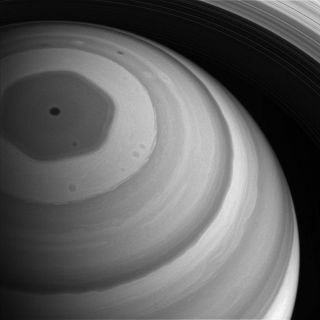 The bizarre hexagon on Saturn, it seems, is ready for its closeup. Last week, NASA unveiled the latest look at the weird hexagon-shaped vortex at Saturn's north pole as seen by the Cassini spacecraft. NASA released the image on Dec. 28, but Cassini actually snapped the picture on Sept. 9. The wide-angle camera on Cassini snapped this image including the sunlit side of Saturn's rings. The spacecraft was at about 51 degrees above Saturn's ring plane, and used a spectral filter using near-infrared light. Cassini was about 750,000 miles (1.2 million kilometers) from Saturn when the image was taken, NASA officials added in the description. The image scale is 46 miles (74 km) per pixel. NASA launched the Cassini mission to Saturn in 1997. The spacecraft arrived in orbit around Saturn in 2004 and has been studying the planet, as well as its rings, moons ever since. In late 2016 Cassini began the final phase of its mission. Over the next several months the spacecraft will orbit Saturn more than 20 times, sending details of the moons and rings. Cassini will end its mission on Sept. 15, when it will be sent into an intentional death dive into the planet by mission flight controllers. Follow us @Spacedotcom, Facebook and Google+. Original story on Space.com.